Don, I just want to say thank you for writing the Absolute Essentials of Music Theory for Guitar. This book cuts to the chase and not a bunch of useless explanations that confuses the crap out of me. Your book is what I have been looking for and although I have a good ear for music, theory has always been a nightmare. At least I have hope for learning what makes the music work. Thanks again and much appreciated. William Baldock Knoxville, TN Don, your books have gotten me further in music theory than any other book, software and video, and I have complete bookshelves just for these music media....You've given me a large appetite for learning music theory and different ways of learning that are so easy even my daughter of 11 can grasp the concepts. Thanks again Don. Tom Flitcraft NJ, USA I'm glad to tell you that I can understand the contents in your music theory book. It's really amazing how you could write such an easily understandable book. It's much easier to understand than those books written in my own language here in Korea. Thank you very much for such brilliant books, Don. Best regards, Sunhong L., Korea Fantastic Book!!! I haven't had time to go through the whole book yet, but here's what I can say... I now understand where all the notes on the fretboard are, and they are taught in such a way that it was easy to understand. I can now put my fingers down anywhere on the guitar and know immediately what note I am playing. I have learned the patterns to where all the different notes fall on each string, and it is not confusing at all. Learning something as simple as that has helped me understand and make sense of things that were otherwise very confusing. I also like the way that the scales have been explained. Learning what the major and minor scales are and how to apply them has also helped tremendously. This book has taken me to the next level in my ability to play the guitar. The book is fantastic and I can't wait until I get more time to finish it off. Jeff K., ON, Canada Great Diagrams. Looking forward to doing the lessons nancyu936, TX, USA Item just like advertised! bbyllma515, KY, USA Fast shipping, good communication, good product. Thanks alot olkman5401, OK, USA Excellent...Thanks!! tunetaylor1, NS, Canada Great transaction! Great product, fast shipment! mr.nardo, IA, USA I’ve been playing guitar for 35+ years (as well as bagpipes and piano) and though I’ve owned and borrowed scores of guitar and music theory manuals, I’ve never come across one so concise, organized, and easy-to- understand as yours! As a teacher myself, your books - along with your excellent illustrations throughout - will help me make my lessons less confusing and much more helpful to my students. If ONLY I had your book when I first picked up a guitar so many years ago… Superlative book. Thanks, Brett Gordon Nashua, NH, USA It really works!! super neato A++ ~~ woodycooks, LA, USA Very clear and complete book, thanks! ~~ ulymunch, CA, USA Mega Awesome Guitar Book! Thanx ~~ dawilba, OK, USA Great book, would deal again ~~ nicknacknoo1, United Kingdom UNBELIEVABLY FAST SHIPPING, GREAT PRODUCT!!!!!!!!!!! ~~ 727tq, BC, Canada Awesome product! I recommend this book to all guitar players! ~~ baretoesinhuron, CA, USA Great book, fast shipment, good communication. Thanks, will order again!!! ~~ squirreltoes, IN, USA Great communication, fast shipping, great book, A+A+A+A+A+A ~~ knapy78, ON, Canada Great transaction thanks for the great books ~~ sdivin_steve, CA USA Book is very helpful. ~~ surftilldawn2000, ON, Canada Great book, quick shipping, excellent communication. A fine seller indeed A+++ ~~ charlie_falcon, MB, Canada Quick shipping. book looks great ~~ jimregan79, NY, USA Awesome product & super nice guy!! I will definitely be dealing with him again!! ~~ bigyellowbike, AB, Canada Just as promised...looks great. Hope to do business again. A+++ seller! ~~ sralder, OR, USA Very nice purchase. Recommended seller. ~~ audiobuilder211, Spain Perfect!! ~~ cherry_bomb_babies_lv, USA Great book! Prompt shipping. Great seller! ~~ bigbrun, WI, USA Nice book with super shipping and service. Thank you. ~~ stuts14, ON, Canada Nice item, packed well, would do business with again, A+++++++++++ ~~ rfarmer, TN, USA As advertised...... good deal, thanks ~~ bubba9497, VA, USA Excellent product and Delivery A+++++++ ~~ crazedtec2klz, CA, USA Nice learning tool ~~ breahton, OH, USA Don, Your book is simply the best I have ever purchased for learning music theory. Trust me, I have purchased enough books and have been so disappointed and failed miserably in my attempt to learn the guitar. Your lessons can't be measured in dollars but with gratitude and appreciation for your kindness to help others with practical applications. I can't begin to tell you how appreciative I am that you would share with others your knowledge, lessons and in a way that is not overwhelming but within grasp and a sense of reaching our goals of becoming a well taught guitarist. Thanks so much. William Baldock Knoxville, TN Excellent book it shows everything u need to know to master the instrument AAAAA ~~easmnuber1, NJ, USA This is a great book! 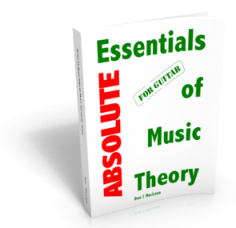 Makes learning music theory for guitar easy! Recommend A+++ ~~thomas1203 NJ, USA Awesome product! I recommend this book to all guitar players! ~~ baretoesinhuron, CA, USA Really Great Book! Explained as clear as can be. Must have! ~~ chan6486, CA, USA Are you ready to finally understand how simple guitar music theory really can be? Simply click on the add to cart button to get started now! 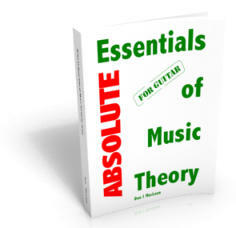 Don, I just want to say thank you for writing the Absolute Essentials of Music Theory for Guitar. This book cuts to the chase and not a bunch of useless explanations that confuses the crap out of me. Your book is what I have been looking for and although I have a good ear for music, theory has always been a nightmare. At least I have hope for learning what makes the music work. Thanks again and much appreciated. William Baldock Knoxville, TN Don, your books have gotten me further in music theory than any other book, software and video, and I have complete bookshelves just for these music media....You've given me a large appetite for learning music theory and different ways of learning that are so easy even my daughter of 11 can grasp the concepts. Thanks again Don. Tom Flitcraft NJ, USA I'm glad to tell you that I can understand the contents in your music theory book. It's really amazing how you could write such an easily understandable book. It's much easier to understand than those books written in my own language here in Korea. Thank you very much for such brilliant books, Don. Best regards, Sunhong L., Korea Fantastic Book!!! I haven't had time to go through the whole book yet, but here's what I can say... I now understand where all the notes on the fretboard are, and they are taught in such a way that it was easy to understand. I can now put my fingers down anywhere on the guitar and know immediately what note I am playing. I have learned the patterns to where all the different notes fall on each string, and it is not confusing at all. Learning something as simple as that has helped me understand and make sense of things that were otherwise very confusing. I also like the way that the scales have been explained. Learning what the major and minor scales are and how to apply them has also helped tremendously. This book has taken me to the next level in my ability to play the guitar. The book is fantastic and I can't wait until I get more time to finish it off. Jeff K., ON, Canada Great Diagrams. Looking forward to doing the lessons nancyu936, TX, USA Item just like advertised! bbyllma515, KY, USA Fast shipping, good communication, good product. Thanks alot olkman5401, OK, USA Excellent...Thanks!! tunetaylor1, NS, Canada Great transaction! Great product, fast shipment! mr.nardo, IA, USA I’ve been playing guitar for 35+ years (as well as bagpipes and piano) and though I’ve owned and borrowed scores of guitar and music theory manuals, I’ve never come across one so concise, organized, and easy-to-understand as yours! As a teacher myself, your books - along with your excellent illustrations throughout - will help me make my lessons less confusing and much more helpful to my students. If ONLY I had your book when I first picked up a guitar so many years ago… Superlative book. Thanks, Brett Gordon Nashua, NH, USA It really works!! super neato A++ ~~ woodycooks, LA, USA Very clear and complete book, thanks! ~~ ulymunch, CA, USA Mega Awesome Guitar Book! Thanx ~~ dawilba, OK, USA Great book, would deal again ~~ nicknacknoo1, United Kingdom UNBELIEVABLY FAST SHIPPING, GREAT PRODUCT!!!!!!!!!!! ~~ 727tq, BC, Canada Awesome product! I recommend this book to all guitar players! ~~ baretoesinhuron, CA, USA Great book, fast shipment, good communication. Thanks, will order again!!! ~~ squirreltoes, IN, USA Great communication, fast shipping, great book, A+A+A+A+A+A ~~ knapy78, ON, Canada Great transaction thanks for the great books ~~ sdivin_steve, CA USA Book is very helpful. ~~ surftilldawn2000, ON, Canada Great book, quick shipping, excellent communication. A fine seller indeed A+++ ~~ charlie_falcon, MB, Canada Quick shipping. book looks great ~~ jimregan79, NY, USA Awesome product & super nice guy!! I will definitely be dealing with him again!! ~~ bigyellowbike, AB, Canada Just as promised...looks great. Hope to do business again. A+++ seller! ~~ sralder, OR, USA Very nice purchase. Recommended seller. ~~ audiobuilder211, Spain Perfect!! ~~ cherry_bomb_babies_lv, USA Great book! Prompt shipping. Great seller! ~~ bigbrun, WI, USA Nice book with super shipping and service. Thank you. ~~ stuts14, ON, Canada Nice item, packed well, would do business with again, A+++++++++++ ~~ rfarmer, TN, USA As advertised...... good deal, thanks ~~ bubba9497, VA, USA Excellent product and Delivery A+++++++ ~~ crazedtec2klz, CA, USA Nice learning tool ~~ breahton, OH, USA Don, Your book is simply the best I have ever purchased for learning music theory. Trust me, I have purchased enough books and have been so disappointed and failed miserably in my attempt to learn the guitar. Your lessons can't be measured in dollars but with gratitude and appreciation for your kindness to help others with practical applications. I can't begin to tell you how appreciative I am that you would share with others your knowledge, lessons and in a way that is not overwhelming but within grasp and a sense of reaching our goals of becoming a well taught guitarist. Thanks so much. William Baldock Knoxville, TN Excellent book it shows everything u need to know to master the instrument AAAAA ~~easmnuber1, NJ, USA This is a great book! Makes learning music theory for guitar easy! Recommend A+++ ~~thomas1203 NJ, USA Awesome product! I recommend this book to all guitar players! ~~ baretoesinhuron, CA, USA Really Great Book! Explained as clear as can be. Must have! ~~ chan6486, CA, USA Are you ready to finally understand how simple guitar music theory really can be? Simply click on the add to cart button to get started now!